Visit Unibet here with your iPad or Android tablet and register in case you haven’t got an account so far. Once you have registered for an account, you can download the iOS App and apk directly from the mobile website. iPad users can also follow this link to download the App directly from Apple’s iTunes Appstore. But now it’s time to take a look at the App for iPad and Android tablets: What does Unibet do differently than other providers? Especially: What does the app do better? 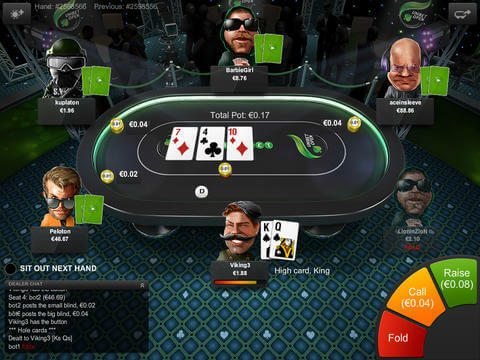 First, there is the look: Unibet offers you a big number of stylish avatars and some really nice-looking poker table backgrounds. You can be a vamp or an astronaut. And you can play poker in a saloon, at a club or at a general’s strategic table. You might already have noticed: Unibet’s poker app is not only about the poker game itself, it’s also about the pleasure that comes with it, it’s about having fun while playing. If you’re an advanced player, there might be poker apps that meet your needs better than the Unibet App does – it’s a rather casual game. Need some prove? Although you can play Fast Fold Poker, there’s no multitabling for instance. You can complete missions and achievements to collect virtual fame and some nice rewards. Unibet’s poker app tries to be a bit of a social game. And, maybe the most important fact: It protects weak players from sharks. There are several functions that make it very hard for advanced players to hunt newbies and fish players. 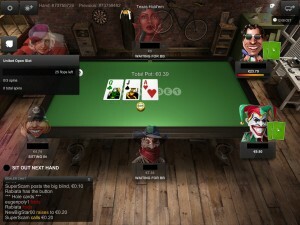 For example, each player can create several poker profiles and switch between them. Weak players simply create a new profile when they had a bad day and no one will recognise them later. Another point is the Quickseat-Lobby: Players are seated automatically. So sharks cannot start their hunt for weak players in the lobby. And what might be most important: It’s not allowed to make digital notes during the game. Poker tracking softwares und HUDs are blocked. So, if you’re a casual player, you can relax and have fun playing poker – without having to fear that there is some experienced opponent thinking “yummy, yummy”. The interface of the Unibet Poker App does look good and works properly. Taking a look at the interface, there’s nothing to worry about. Everything seems to be at the right place. There are three Buttons down right where you can check, fold, call or raise. The chatwindow down left can be made larger with a finger tip. And in the upper left corner there are more options to take care of. Here, the important 4-colors-deck can be activated. And you can switch off sound or animations if you want to. However, from the performance’s point of view there is no need to do so. The app runs smooth, there’s absolutely no lag when tapping on the buttons. Just the way you would expect it from a native App. Still there are two things we need to criticize. The first one: You have to wait for the big blind in order to get started. This might be useful in most cases. But there are some situations where you do NOT want to wait two minutes before you can start playing – especially when you’re on the go and have only a few minutes of time to play. The second one: You better not use the multitasking ability of your iPad when playing poker with the App. As soon as you push the App to the background for a while, you will be forced to log in again when coming back. In our test it was enough to activate the built-in lower menu of the iPad – to set a timer, for example – and we found ourselves back in the lobby with a login prompt. The App recognizes an active game and brings you back to the table. But in one case the login and reload took too long and our hand was folded automatically. And then, after sitting in, we had to wait for the big blind (see above). A pretty frustrating experience we want to save you from. 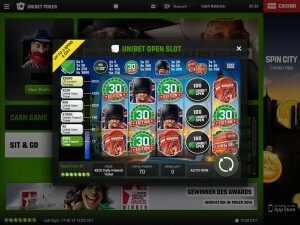 The free and buld in “Unibet Open Slot”-machine lets you win tournament tickets. Let’s take a look at the promotions now. If you register as a new player and make your first deposit, Unibet will double your money with a 100% bonus of up to €500. 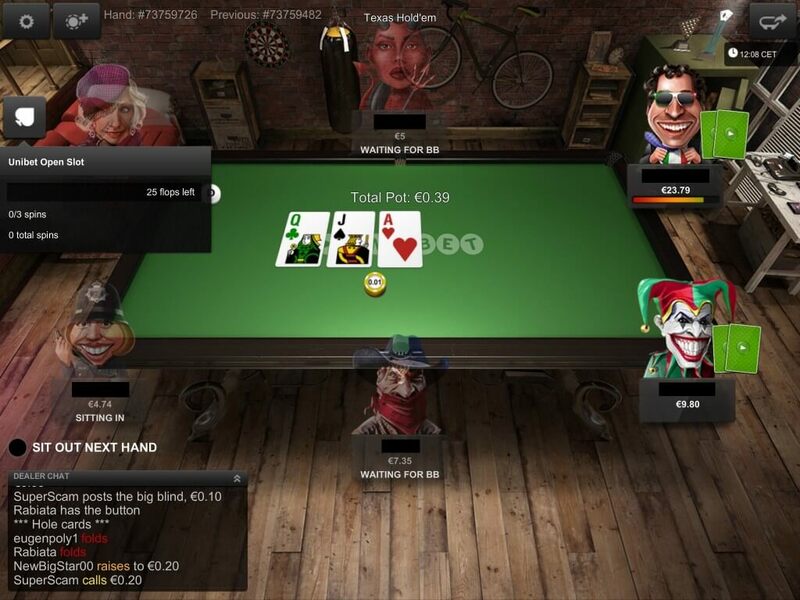 In addition, there are achievements and other promos, making it even more attractive to play poker at Unibet. There is the “Unibet Open Slot” for instance – a free built-in slot machine that makes it possible for you to win tickets for freerolls and tournaments. You can spin it up to three times a day – depending on the amount of poker you play. You will be credited one free spin for every 25 flops you see. Our overall assessment of the app for iPad and Android tablet is a pretty positive one. The new App is significantly better than the old Android App and comes very close to the desktop client. If you are a casual player, we definitely recommend the Unibet poker app to you. You might also want to take a closer look at the 888 poker app. If you’re an advanced player, the PokerStars App might suit you better.